Some automakers are predicting the end of the traditional car and planning future lineups comprised entirely of trucks and SUVs. It’s true, people are buying fewer and fewer cars in favor of SUVs, but perhaps that’s because some automakers just stopped making good cars. They might avoid this self-fulfilling prophecy if they do what Kia does and just make better cars, like this 2019 Kia Forte EX. Want proof? The Forte was Kia’s best selling vehicle last year – better than the Sportage and Sorento SUVs – and it could be again in 2018. All-new for 2019, the Forte features an exterior design inspired by the brand’s high-performance Stinger sedan, a new continuously variable transmission built in-house, and one of the most comprehensive offerings of technology and safety features you can find in any car, let alone a compact “economy” car. There’s really nothing “economy” about the new Forte – it looks, feels, and acts like a car of substantial worth. The Forte starts at $17,690 for the base FE trim level, which is designed to achieve the highest fuel economy rating possible. That’s actually the second-lowest base price among compact cars, beaten only be the Forte’s sister sedan, the Hyundai Elantra, which starts even lower at $15,600. Up from there are the LXS ($19,090), S ($20,190), and this tester’s trim level, the range-topping EX with a base price $21,990. My tester only came with a couple extras – Snow White Pearl Paint ($295) and carpeted floor mats ($125) – that kept its as-tested price in check at $23,305 including an $895 delivery charge. When you consider most compact SUVs have a starting price over $20K, the value of sticking with a traditional car begins to make sense. For instance, if you were to shop for an SUV in the same price range as the Forte, you’d be forced to go down a size and consider a subcompact SUV. Kia says the Forte’s new exterior design is inspired by the Stinger – the brand’s red-hot, rear-wheel-drive sport sedan – but the likeness is confined mostly to the grille area. Still, the new Forte’s looks are an upgrade over last year’s model. Kia’s designers have ditched the swoopy, wind-swept look in favor of broader, more squared off fenders and a blunter face with more interesting details. It’s a handsome, grown-up look that doesn’t scream to the world, “This is the first car I’ve ever owned,” even if it is. Even though the Forte is an economy car, the interior and overall level of comfort is impressive. The design of the dashboard with its infotainment screen perched atop the center stack and the logically laid out controls reminds me of an Audi cabin, which is high praise for this class of car. Aside from the design, the overall level of comfort in the Forte is remarkable. For one, the seats are a joy to spend hours driving in – great for long trips and long commutes. Passenger space is also great for a small car, with all four seats providing generous room for adults. Kia was able to grow the Forte in nearly every interior dimension, with rear legroom being the biggest beneficiary. As for cargo space, while you will get more going with an SUV, the Forte’s 15.3 cubic feet of trunk space is huge and more than you get in most larger cars. In fact, it equals the size of the trunk in the K900, Kia’s legit full-size luxury sedan. The Forte’s rear seat backs also fold down creating a passthrough to accommodate even more stuff. Lastly, the Forte’s level of noise, vibration, and harshness is the best I’ve experienced in this class. The decibel level while driving at 70 miles per hour on the highway is as low as a luxury car. The engine, in particular, is both quiet in operation and exhibits very little vibration, while wind and tire noise can barely be heard. This serenity while driving is a plus that most people shopping in this price range don’t know to look for or believe they can afford. Kia offers an excellent infotainment system in the Forte with an eight-inch touchscreen neatly rising from the dash. The graphics look great, the menus are easy to navigate, and the system is fast to respond to inputs; you can’t ask for more in an infotainment system today. Navigation is an option on the EX model, but my test car did not come with this feature. No matter, though, since Apple CarPlay and Android Auto are standard on every Forte trim level. The EX trim, though, comes standard with cool features like a Smart Trunk that opens automatically just by standing near it with the key fob in your pocket or purse, dual USB charging ports, push-button start with a proximity key, and dual-zone automatic climate control. Items like these are what makes you forget you’re driving an economy car. There is one option package available on the EX. Called the EX Launch Edition package, it costs a healthy $3,210 but comes with such niceties as navigation, a wireless charging pad for your smartphone, an upgraded Harmon/Kardon stereo with subwoofer, LED headlights with auto-leveling, auto high-beam assist, a power sunroof, adaptive cruise control, reverse sensors, and an upgraded information screen between the gauges. It’s worth the money. The new Forte may share some design cues with the Stinger, but it wasn’t blessed with the same driving dynamics. This car is mainly designed for comfort, not performance, and so its suspension is tuned more for a comfortable ride than confident handling. Power comes from a 2.0-liter four-cylinder engine producing 147 horsepower and 132 pound-feet or torque (although a more powerful variant is due for next year). It’s more than adequate and never feels overwhelmed, but neither is it overly energetic. Curiously, Kia runs the engine with Atkinson Cycle technology, which is usually reserved for engines paired with electric motors in hybrid cars. I can’t say I noticed a difference in the engine’s operation, so if Kia claims it aids fuel economy, then it’s worth it. Kia developed a new continuously variable transmission developed in-house and it’s one of the best transmissions of its kind. To be honest, I didn’t realize it was a CVT until I looked at the car’s specs. Kia engineers addressed all of the bugaboos that give CVTs a bad name, including their “rubber-band” feel and generally buzzy, droning sound. The Forte’s transmission exhibits none of these faults. Kia does include three selectable drive modes with the Forte: Normal, Comfort, and Sport. The first two feel very similar, though, while Sport mode doesn’t go far enough with its tweaks to the car’s steering and throttle responses to make the Forte feel actually sporty. The Forte offers a tremendous amount of safety technology, both as standard equipment and optional, for its class. Every trim level comes standard with passive and active safety features like forward collision warning, lane departure warning, automatic emergency braking, lane-keep assist, and a driver attention warning system. The top-of-the-line EX model I tested, meanwhile, comes standard with additional safety equipment like a blind-spot warning system with lane change assist and rear cross traffic alert. Lastly, the EX trim level also offers the optional Launch Edition package for $3,210 that adds special pedestrian detection capabilities to the forward collision warning system, as well as powerful LED headlights with auto-leveling, rear parking sensors, and adaptive cruise control. There are cars costing four times as much as the Forte that aren’t so well equipped when it comes to safety. 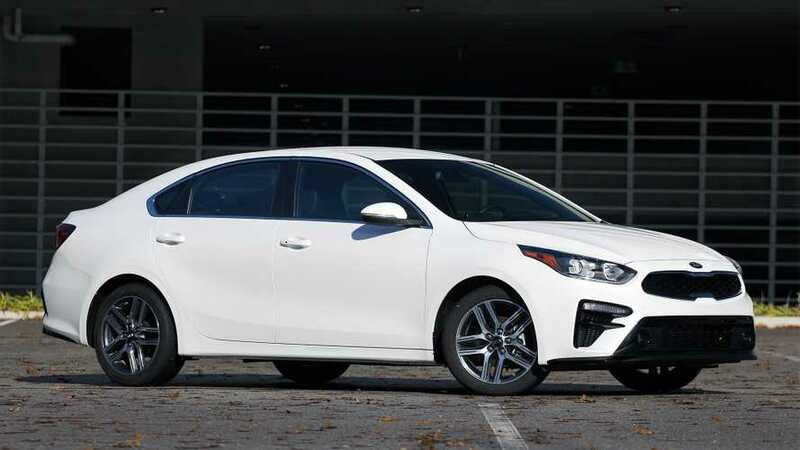 The Environmental Protection Agency rates the 2019 Kia Forte as achieving 30 miles per gallon in the city, 40 on the highway, and 34 combined. That’s competitive for the class, though not class-leading. If fuel efficiency is more important to you than creature comforts, you might consider the Forte FE, which is the base level trim that has extra fuel-saving features. It’s rated slightly higher at 31 mpg city, 41 highway, and 35 combined.